Standing at Love’s Seafood on the banks of the Ogeechee River on Friday night waiting for the arrival of celebrity environmental activist Erin Brockovich, I found myself imagining what it must have been like when the restaurant opened back in 1949. Owner Fulton Love remembers and can tell you stories of fishing so great that you had to invite a crowd to help you cook and eat your catch. But things have changed. The Ogeechee is no longer the rich source of fish and game that it once was. Folks along the river wonder, on a day–to–day basis, whether it’s even safe to get in the water, and the days are gone when a decent day of fishing meant at least a cooler full of bream and bass. 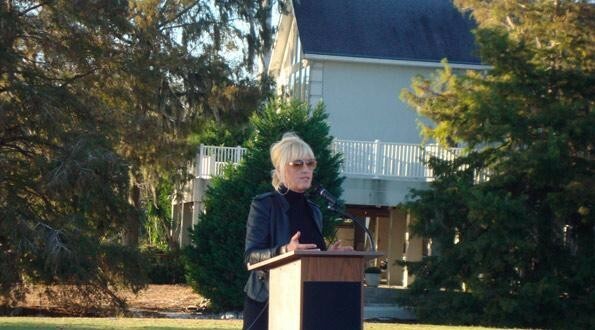 Erin Brockovich was invited by Ogeechee Riverkeeper Dianna Wedincamp to come see the Ogeechee for herself. She visited with locals near the King America Finishing Plant and then came to Love’s for a stirring sunset speech pledging her support for the Riverkeeper’s fight. A crowd of at least 200 people who waited patiently for her arrival got the rousing call to action from Brockovich they came to hear, along with a promise that her organization would be launching an investigation into what is happening to the Ogeechee River. She spoke eloquently about her visit earlier in the day with landowners and others who grew up and live on the Ogeechee River, and how their questions remain unanswered by the state of Georgia and King America Finishing (KAF). Brockovich and her associate, Bob Bowcock, have vowed to start an investigation into what caused the catastrophic fish kill in 2011, when over 38,000 fish died and the river was closed to all recreational activity for weeks. They plan to dedicate their time to working with Ogeechee Riverkeeper and state agencies and will make themselves available to the citizens along the river and keep them informed. “It’s time for the people to direct the regulators... if we keep thinking [the problem] is going away, we are mistaken,” Brockovich said. Since KAF has been responsible for its own monitoring and testing, questions remain about what exactly has been going into the water. Information about proprietary manufacturing techniques and the chemicals and compounds those techniques require have been difficult to ascertain. Ogeechee Riverkeeper has done extensive water testing since learning of the fish kill in May 2011, but at costs hovering around $1,000 per test, there are limits to its ability to perform testing for more than the basic contaminants. Bowcock outlined some potential ways to help Riverkeeper with that process, including assistance with testing for chemicals and byproducts of chemicals earlier investigations may not have considered. Brockovich and Bowcock have promised their own investigation will complement and augment Riverkeeper’s existing testing protocols. “What it takes is us as citizens pushing back against the agency ... it’s supposed to be there to protect us,” Brockovich said. City of Savannah Council Members Tony Thomas and Estella Shabazz surprised Brockovich with the key to the City of Savannah. Brockovich’s involvement with a groundwater contamination lawsuit in California resulted in a $333 million settlement in 1996 and a hit movie bearing her name. Will a collaborative approach between Ogeechee Riverkeeper and Team Brockovich provide a nudge to the State of Georgia to issue King America Finishing a permit with teeth and enforce the law? With the key to the City of Savannah glinting in the fading sunlight and the happy applause of hundreds of Brockovich’s fans ringing in my ears, I allowed myself a brief moment of hope that the future of the Ogeechee looked a little brighter.